Today, almost all human beings communicate with Mobile phone (HP), Telephone handheld comfortable to wear anywhere indirect just discovered, but through the stages are long, from early discovery of the phone is still using the cable but on the merit of Martin Cooper, the phone can be used wirelessly as we now use it. Mobile or mobile phone (telgam) or mobile phone (HP) or also called electronic telecommunications equipment that has the same basic capabilities with conventional fixed line phone, but can be taken anywhere (portable, mobile) and unnecessary connected to the telephone network using cable (wireless, wireless). Indonesia currently has two wireless telephone networks: GSM system (Global System for Mobile Telecommunications) and CDMA (Code Division Multiple Access) system. The agency governing Indonesia's cellular telecommunications is the Indonesian Cellular Telecommunication Association (ATSI). On April 3, 1973, the first mobile phone system was invented by Martin Cooper, a Motorola employee. although much touted the inventor of a mobile phone is a team of one of Motorola's divisions (the division where Cooper works) with the first model is DynaTAC. The idea coined by Cooper is a small and flexible traveling mobile device. Cooper and his team face the challenge of incorporating all the electronic materials into the small tool for the first time. But finally a first mobile phone successfully completed with a total weight of two kilograms. To produce it, Motorola costs equivalent to US $ 1 million. "In 1983, portable mobile phones cost US $ 4 thousand (Rp36 million) equivalent to US $ 10 thousand. As a successful mobile phone support, the next biggest challenge is adapting the infrastructure to support the mobile phone's communications system by creating a network system that requires only 3 MHz of spectrum, equivalent to five channel TV channels across the globe. In addition to Martin Cooper, there is another character who is known to be very meritorious in the world of mobile communication Amos Joel Jr. born in Philadelphia, March 12, 1918, he is recognized as a world expert in the field of switching. He received a bachelor's degree (1940) and master (1942) in electronic engineering from MIT. Not long after the study, he began his career for 43 years (from July 1940-March 1983) at Bell Telephone Laboratories, where he received over 70 US patents in telecommunications, particularly in the field of switching. Amos E Joel Jr., makes the mobile phone (switching) system from one cell region to another cell region. This switching should work when mobile users move or move from one cell to another so that the conversation is not interrupted. Because of Amos Joel's discovery is the use of mobile phones to be comfortable. Thus the history of the beginning of the invention of Mobile, until now its development has become very rapid, in addition to speaking and sending short messages (SMS), some advanced features are embedded in this communication tool such as internet connection , 3G technology, curved screen to transparent hanphone. 0 Response to "Who Invented The First Mobile Phone (Handphone)? 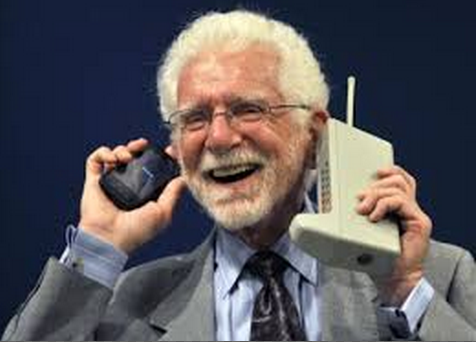 History Of Mobile Phone (Handphone)- Biography of Martin Cooper"